(APN) ATLANTA — Basil Eleby, 40, the homeless man who is accused of starting a fire that caused a portion of Interstate 85 to collapse in Atlanta, has some of the best legal minds defending him plus a growing coalition of 25 diverse community and civil rights organizations that have raised concerns about his case. Almost immediately after the fire and collapse that took place on March 30, 2017, Eleby was arrested and charged, based on testimony of two alleged crack cocaine users who said he maliciously started a fire; and a theory that, somehow, this fire combined with explosive materials being stored under the Interstate, causing the Interstate itself to literally catch on fire and collapse. 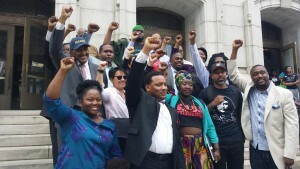 Eleby’s legal defense team and the Coalition in support of Eleby held a press conference on the steps of the Fulton County Courthouse in downtown Atlanta on April 12, 2017. This outpouring of support from across political lines shows that many believe Eleby is being used as a scapegoat for mistakes the Georgia Department of Transportation (GDOT) made by storing large spools of high density plastic polyethylene conduit under the expressway. Due to the fact that the fire destroyed most of the evidence, it is not known what else may have been stored under I-85 expressway. The Coalition is concerned that government officials are trying to avoid public scrutiny and accountability by blaming Eleby. “We want to send a message to GDOT that we are putting you on notice today that Mr. Eleby will not be the scapegoat for this tragedy,” Marcus Coleman, Founder, Save Our Selves, said at the press briefing. Currently Eleby is facing 25 years in prison, a 200,000 dollar bond, and the possibility of additional federal charges. His pro bono dream team includes four prominent attorneys–Mawuli Davis, Tiffany Roberts, Lawrence Zimmerman, Gary Spencer–and a army of other lawyers who are working behind the scenes to investigate what happened. “This is a criminal act of negligence by the State of Georgia, the Department of Transportation, and we will not allow Mr. Eleby to be a scapegoat. Instead of investigating who housed highly flammable materials that put citizens of Atlanta at risk and people who travel the highway, they decided to criminalize Eleby,” Kalonji Changa, National Coordinator, Organization to Combat Police Terrorism, said. “This isn’t just a railroading, this is a railroading on steroids. You have this catastrophic outcome and you pick this one little guy who is the reason for the entire collapse of I-85, that’s absurd,” Davis said. “We do not concede that he set any fire at all,” Davis said. “Eleby is one of two thousand people in Atlanta who sleep under bridges, in back alleys, any place they can find a safe and warm place to sleep. That is sad and that is an indictment on our society,” Rev. Francys Johnson, President, Georgia chapter of the National Association for the Advancement of Colored People (NAACP), said. “This coalition does not speak for Basel Eleby but for the many Eleby’s who are homeless, continue to suffer from lack of affordable housing, substance abuse, and can’t get the drug treatment or mental health centers, and resources they need – all in a climate where budgets are being cut and slashed at the national and state level,” Rev. Johnson said. The Coalition encourages people to pack the courtroom at Eleby’s arraignment on Tuesday, April 18, at 9:00 am, courtroom 5F at the Fulton County Courthouse, 185 Central Avenue, for justice for Eleby. Thank you Gloria and APN for this story. The major question that needs to be answered is how someone could allegedly light fire to a chair and burn down a concrete structure. That is physically impossible..